In this week’s guitar lesson, you’ll learn how to use harmonized leads when you improvise and how to connect those leads to basic chord shapes so that you can easily find them. I’ll show the pattern for playing both harmonized 3rds and harmonized 6ths. In this week’s guitar lesson you’ll learn how to play a heavy blues lead on electric guitar (although you can play the first half on acoustic if that’s all you have). You’ll learn how to play the chord changes in this 12 bar blues structure. Included MP3 jam track and tablature. In this week’s guitar lesson you’ll learn how to play the Christmas classic “What Child Is This?”, which is the melody of the song “Greensleeves”. I’ll show you how to play this solo guitar (no accompaniment) with a pick. In this week’s guitar lesson, you’ll learn an easy to play solo blues composition that’s played solo guitar (no accompaniment). The licks are all played on the bottom 3 strings to give you ideas for leads that you can play using lower notes. This week’s guitar lesson is a slow and dark sounding blues composition that’s played solo guitar (no accompaniment required). This is also played fingerstyle so you’ll be keeping time by simulating a bass line on each beat. This sounds great on acoustic or electric guitar. In this week’s guitar lesson you’ll learn several classic Rockabilly style techniques including embellishing around an A6 chord. 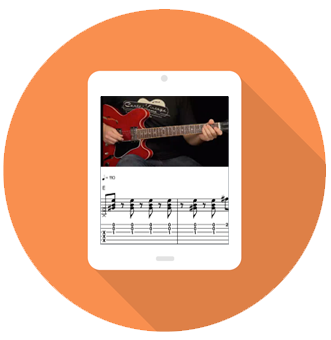 You’ll also learn an easy way to play chord changes by picking notes out of chords instead of thinking of scales.